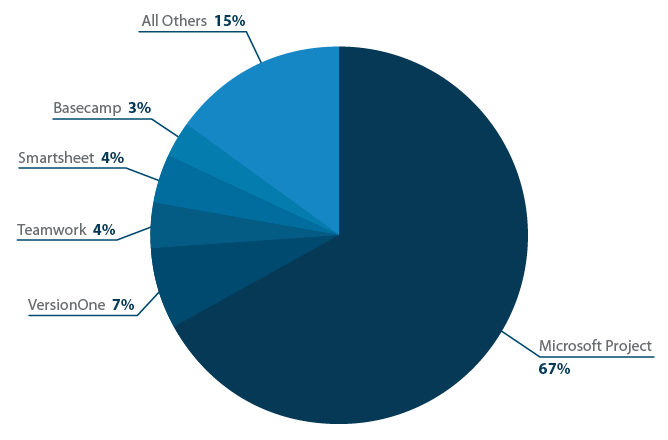 Capterra surveyed users of project management software to gain insight into how users buy and use this software. Turns out your level of satisfaction with your project management system could stem from how you buy it. Read on to find out why. Project management software is software that provides an overview of the goals, resources, and processes for projects. Project management software is often used as a tool for project communication, creating workflows, and aiding with specific project management techniques, like Agile or Waterfall. 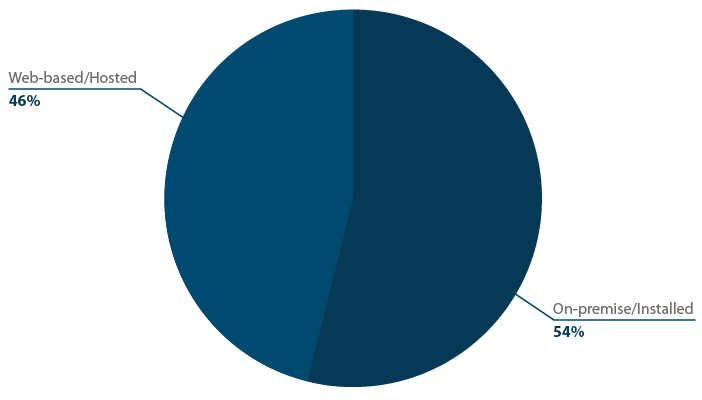 According to PriceWaterhouseCooper's Insights and Trends: Current Portfolio, Programme and Project Management Practices, almost all — 97% — of surveyed companies believe that project management (PM) is "critical to business performance and organizational success, and 94% agreed that PM enables business growth." They also found that "The use of commercially available PM software drives higher levels of portfolio performance and greater satisfaction with an organization's project management practices." Our project management survey aimed to find exactly how project management softwarehelps organizations improve their project management process, what software worked best for surveyed organizations, and how users can ensure they are getting the best software for their company. 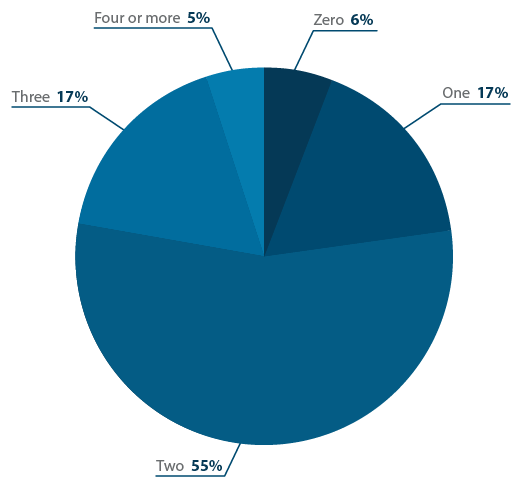 A majority (56%) of organizations have only used one project management system. 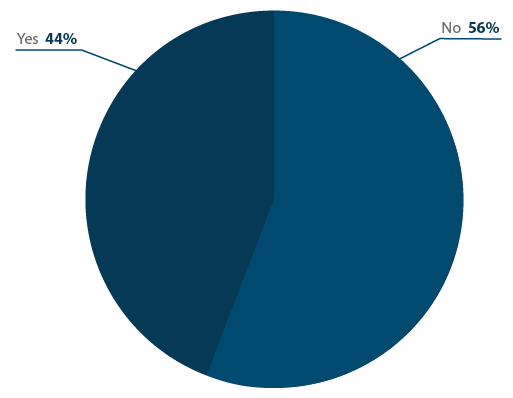 About a quarter (24%) of respondents use Agile or Scrum-specific project management software. Organizations typically spend $10,329 a year ($861 a month) on project management software. 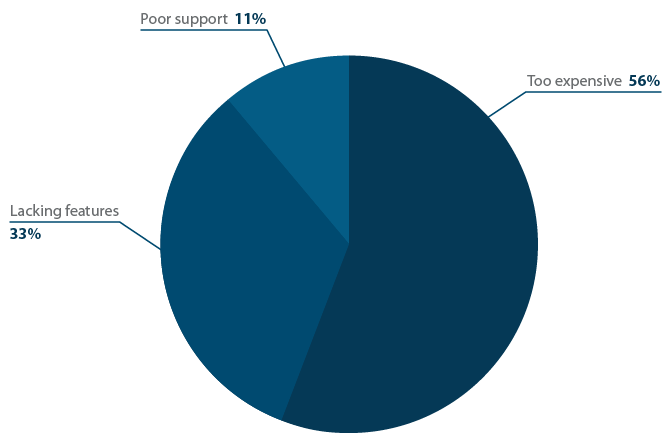 Of respondents who are dissatisfied with their project management software, more than half (56%) say the cause is that the software is too expensive. Project management software has the greatest positive impact on team communication, according to respondents. The types of organizations that use project management software span across industries. All industries are closely represented, with manufacturing taking slightly more representation (10%) than other industries. 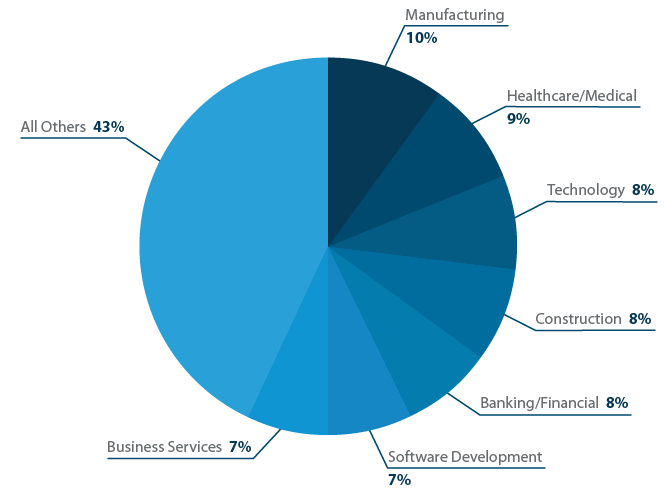 Close seconds include healthcare/medical (9%), construction (8%), banking/insurance/financial services (8%), and technology (8%). Underrepresented industries include advertising/marketing/PR/communication (4%), consulting services, education (5%), and government/municipal (5%). While these industries certainly have projects that would benefit from project management software, they could be severely limited by cost and the time it takes to train employees to use it. Which revenue band best describes the size of your organization? 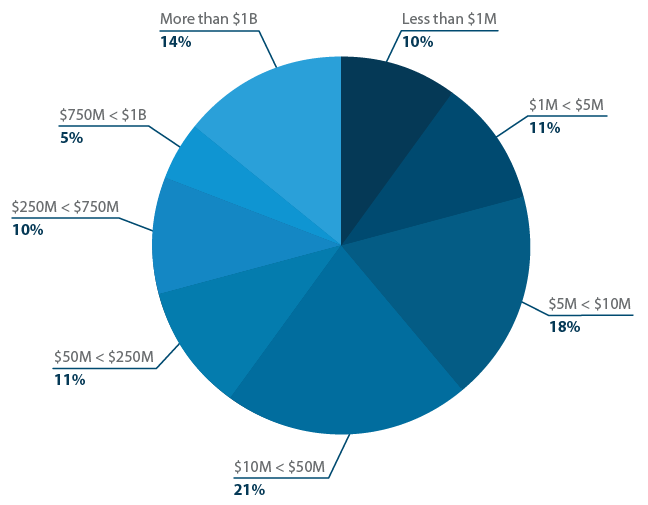 Of those that we surveyed, a majority of organizations using project management software earn between $10M and $50M. While there are a number of free project management software options, most companies opt to pay for their project management software. While there is a huge range of how much project management software costs, The average respondent spent over $10k per year on project management software.Tweet Thisthe average respondent spends $10,328.71 a year on project management software (or $860.73 a month). How much did you expect to pay for project management software? How much did you actually spend? With that said, the median spend is $1,200. The large discrepancy comes from the uneven spend distribution between companies. For example, 50% of companies spent more than $1,000 a year on project management software and another 21% spent over $10K. This accounts for the higher average and lower median. What project management software do they use? Similar to what was found in our survey of The Top 20 Most Popular Project Management Software, a strong majority (67%) of organizations use Microsoft Project. That's unsurprising, since most organizations rely on other Microsoft applications as a default, such as Office Suite. Organizations are also fairly evenly split between using web-based project management software (46%) and installed software (54%). This can be explained because most users of Microsoft Project choose to use a local option. With that said, as the world heads more toward the cloud, expect more project management software to move into the cloud. Is your project management software web-based or on-premise? How do project managers choose their software? Choosing the right project management software can be a daunting process. While there are guides to choosing project management software, these insights will help shed light on the project management software buying process. Were you using a different project management system before purchasing your current software? Slightly more than half (56%) of project management software users are first-time purchasers. This suggests two things: project management software is growing in popularity, and organizations using project management software continue to use the original system that they started with. 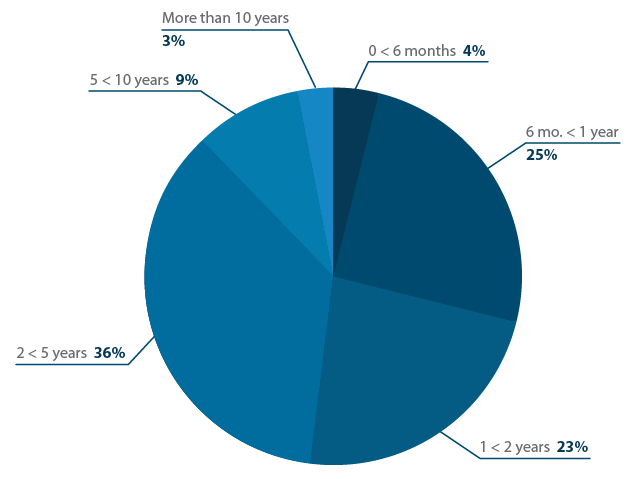 How long have you been using your current project management software? Perhaps this is why so many of those surveyed have stuck with their project management system for two years or longer. Our findings suggest that while users are fairly evenly split between new users (less than two years) and seasoned users (two years or more), 88% of businesses have used their project management software for less than 5 years.Tweet Thisthe large drop off at five years or more is indicative of seasoned users looking for newer features and updated systems. 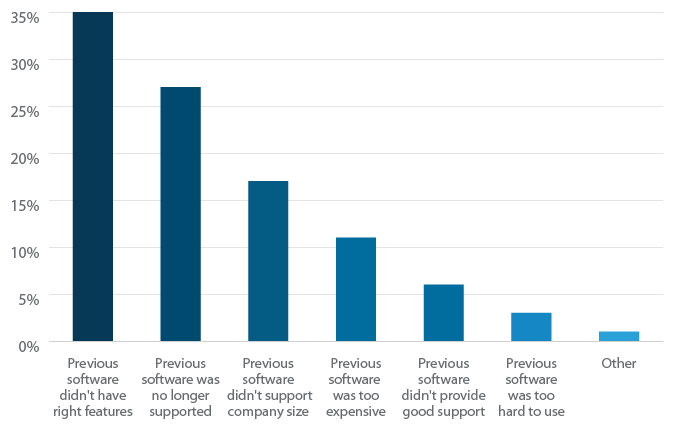 Our survey found that almost half (46%) of new project management software buyers were switching from their old system because the previous software was longer supported or because their previous software did not have the features that they were looking for. This is somewhat surprising, as most people are dissatisfied with their current software because of cost (as described below). This suggests that while cost may be burdensome, companies are willing to spend a little more for project management software that offers more features. How long in weeks did you expect to spend searching for your project management software (from research to final purchase?) How long did it actually take? 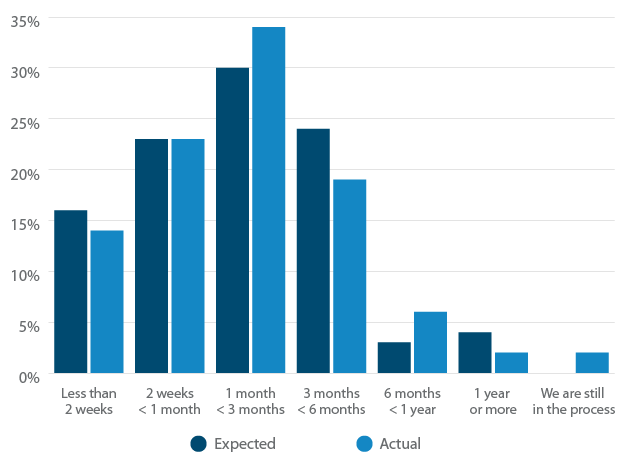 The expectations of how long it would take and how long it actually took to find new project management software lined up fairly evenly; 37% of respondents expected that it would take them two to four weeks to find software, and 26% expected it would take four to six weeks. In reality, it took 31% of respondents two to four weeks, and 29% of respondents four to six weeks. 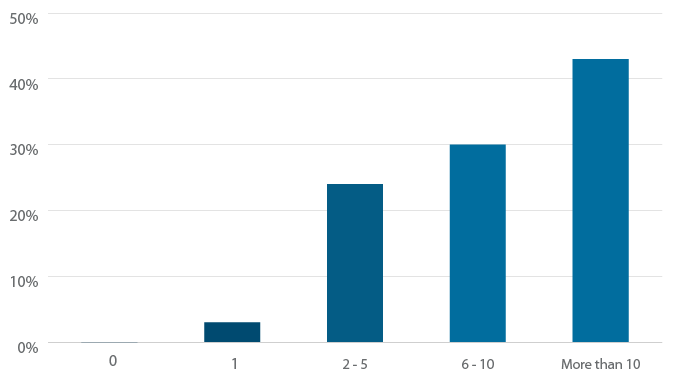 In total, 22% underestimated how long it would take to find new software, and 23% overestimated. How many options did you demo before making your final purchasing decision? 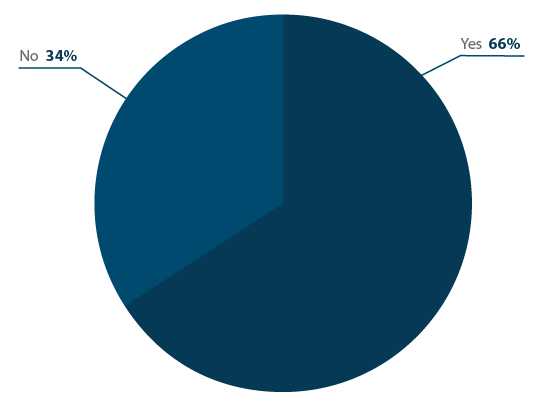 While looking for project management software, a majority (55%) of buyers demoed two options; only 6% chose to forgo demoing their new system. 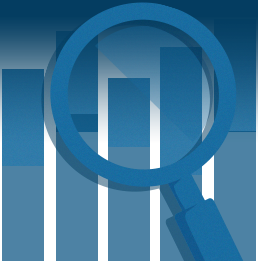 What project management software features were buyers looking for? The motivation to buy project management software varies by project team. The most desired feature was functionality, followed by ease of use, price, and support. A software product's popularity was dead last, indicating that heavily informed project management software buyers are less swayed by the market than by their own, unique needs. The top-used features include file sharing, time tracking, email integration, and Gantt charts. 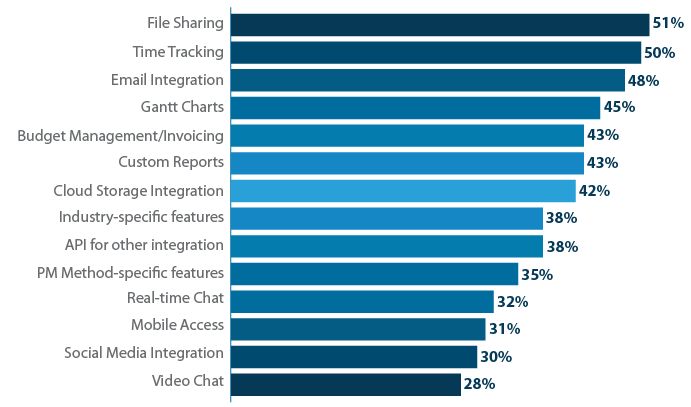 Organizations are least-likely to use video chat, real-time chat, social media integration, and mobile access. This insight is somewhat ironic, as a majority of the latter features are communication tools. Respondents overwhelmingly claim that their project management software helps most with communication, followed by increasing the number of projects completed on time, on budget, and of higher quality. The abovementioned features are probably less desired because they are newer, organizations haven't figured out how social media can improve project productivity, and users are more likely to rely on their desktops than mobile unless in specific industries requiring a lot of site work, such as construction or field service. What aspects of business were significantly improved by project management software? Two-thirds of companies are communicating with clients using project management software.Tweet ThisAs seen below, a strong majority (66%) of organizations use their project management software to communicate with their clients—and most project managers communicate with over ten clients at a time. Do you use your project management software to communicate with clients? This may also be indicative of why project managers value file sharing and time tracking so highly — these features can be used to communicate critical project and billing information to their stakeholders. 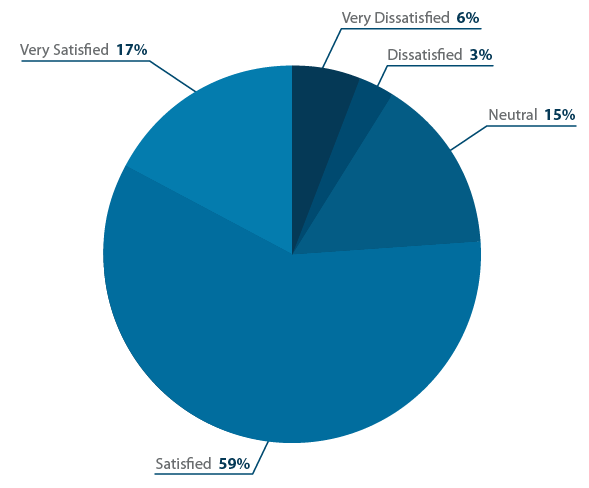 How satisfied are buyers with their software? In general, organizations are happy with their project management software. Of those surveyed, almost six in ten (59%) said that they were "satisfied" with their current project management software, and 17% said they were "very satisfied." How satisfied are you with your current project management software? 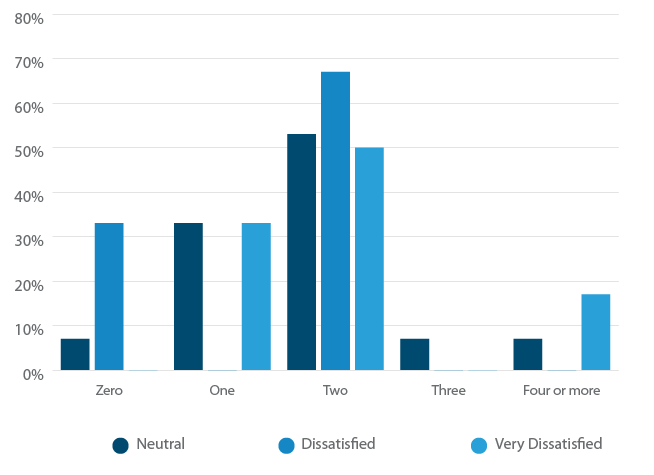 While three-quarters of those surveyed were "satisfied" or "very satisfied" with their project management software, a quarter (24%) was neutral, dissatisfied, or very dissatisfied. The largest driving factor for dissatisfaction with their project management software was cost. Why are you unsatisfied with your current project management software? 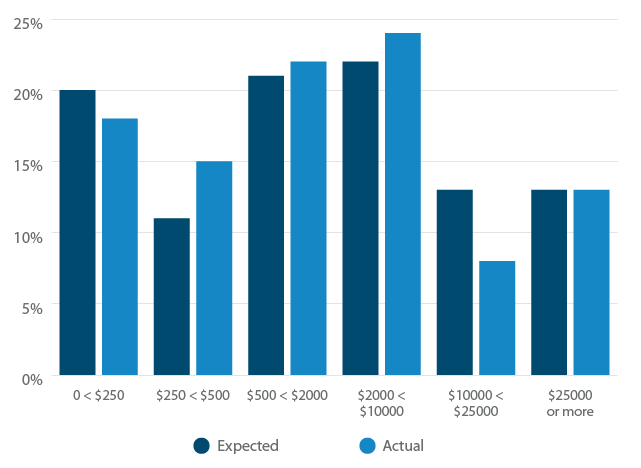 In fact, when breaking out how much users are spending on their project management software, it's clear that buyers who are spending $25,000 or more per year on project management software are least likely to be satisfied. The number of demos that organizations tried also has a significant impact on software satisfaction. A majority of those who are very dissatisfied with their project management software tried four or more project management software options. While this may seem counterintuitive, these organizations were likely looking for premade software when what they needed was a custom solution. Instead, they ended up overpaying for software that didn't offer the features that they were looking for that were specific to their organization. 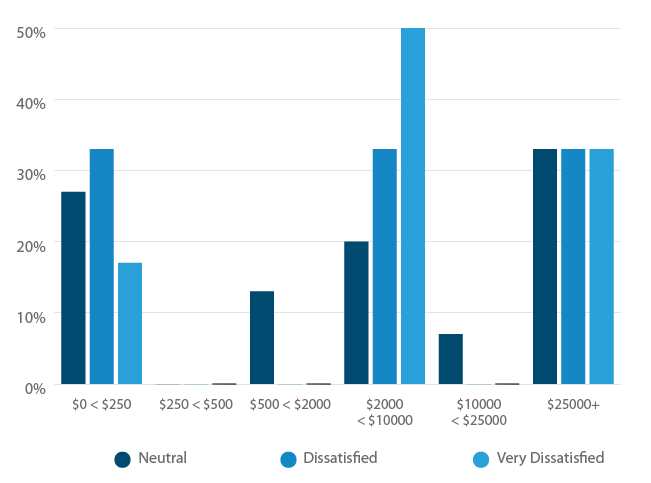 Alternatively, previous Capterra research shows that those who demo too many software options are least-satisfied with their software purchases, regardless of software vertical. This may be because purchasers want to be totally certain that they are investing in the best software, and feel insecure after trying too many overwhelmingly different options. In other circles, this is called the “curse of knowledge." Capterra's project management software study shows that organizations are completing their projects on time and on budget and with higher quality when implementing project management software. Teams using project management software are also likely to communicate better. The biggest cause of dissatisfaction among the minority who don't care for their project management software is due to cost, followed by demoing too many products. Capterra collected the data in this learning management systems report through a 24-question survey to project management software buyers and users online, conducted over the course of two weeks and receiving a total of 100 qualified responses. Rachel is a Content Marketing Analyst for Capterra, a free online resource that quickly matches businesses to their software needs. She specializes in construction, project management and school administration. On the rare occasion Rachel isn't writing, she's reading, hiking, jogging, or spending time with her friends and family.